Like the site and our translation service? Please consider a donation. Instead, the tattoos spell "Semolina", you know, the flour-like stuff that's used to make a sort of porridge. Burnt porridge from the looks of it. How did that happen? Well, the boys meant to have the Hebrew word "Salach" which doesn't mean "Forgiven" anyway, it actually means "Forgave". However, their intentions were fouled by the similarity of the Hebrew letters Het and Tav. And so, "Salach" turned into "Solet" which means Semolina - a simple, totally non-spiritual food. It can also be read as a misspelled "Salat", which means Salad in Hebrew. Actually, there's a good reason so many "Forgiven" tattoos go wrong. It simply isn't as straightforward a concept in Hebrew as it is in English. You can see a previous post about "Forgiven" tattoos. Different ways to write it are discussed both in the post and in the comments. Currently I prefer (and suggest) the following form: "Nimchalti" - "I was Forgiven" for those of you who'd like to have it as a Hebrew tattoo. It works for both genders and sounds more personal than the other options. I'd like to quibble with your meaning, here: נמחלתי means that forgiveness was granted for myself (for existing). נמחלו עוונותי would mean "my sins were forgiven", which is I think more what Messrs. Semolina were trying to convey. Their tattoos reflect one of the Kabbalic three-lettered God's names. It doesn't have to have a specific meaning in Hebrew nor Aramaic. God's name from Kabbalah? Not in this case, I'm afraid. If you study the names table on your wiki link, you'll see that this one is absent. Not every three lettered Hebrew word can be passed as a Kabbalistic God-name, there are only 72 of those! "Oy, sh-te'he'u bre'eem." ('They should be healthy') My hebrew reaction, said in friendship, frustration, and empathy. These tossed-salad boy-toys need matching 'Sa-lach-ti O-to' tattoos, each with a left or right-pointing arrow, and then they'll need to always walk together, 'forgiven', in the proper formation on the beach. There is an element of homo-eroticism in Christianity, I've always felt; bonding with the Virgin Mary/ Earth-Goddess being somehow off-limits in their theology. Sorry, I digress. (And even if they'd gotten it right: Het, Lamed, Samech, I'd still read it as Hallas!, the Arabic for "Enough Already." Jesus died for sins, but mebbe not these sins. A couple of points from a Hebrew speaking geek. First, You can't forgive someone directly in Hebrew (like smart Yoni mistakenly wrote, "Salachti Oto"), you must either use a Lame"d to indicate who you forgave - 'Salachti LeYossi' (I forgave Yossi), 'Nislach Li' (I was forgiven - instead of 'Nislachti' which sounds weird), or indicate some act that was forgiven like in the correct and meaningful 'Nislechu Avonotai' (My sins were forgiven) example above. Nislach is good though it immediately raises the question what or who was forgiven. All this applies just as well to Me"m Che"t Lame"d as it does to Same"ch Lame"d Che"t.
Apologies to Muxie for not including him in my little inside joke: I've said "Ti'slach O'TI" wrong on purpose here for twenty years, just to see who bothers to correct me. Same for "Ik'pat li" (It cares to me?) My destiny in hebrew is to fix 'backward' constructions, and I accept it, even at the expense of the occasional ill-tempered comment. Me'n the semolina twins 'sol'chim le'Mux'. Beseder? Of course, it's great to have a Hebrew tattoo when you're getting one for a completely Christian concept, fer chrissake. My first impression was that they transliterated "salt" and were standing by the Dead Sea. But then I was enlightened to the solet/semolina theory. would anyone be able to tell me what those specific characters are in hebrew? I know the first character is Yod, the third is Lamed, and the last two MEM and Nun? Reading right-to-left: Nun, Mem, Het, Lamed, Tav, Yod. Nimchalti. What's wrong with "Ik'pat li"? That's how you say "I care". You can't say it differently. Please use the Name/URL option to sign your comment (URL is optional). Comments signed as Anonymous won't be published anymore. Do you want a Hebrew tattoo? Are you absolutely sure? Most of the Hebrew tattoos you see on the web are misspelled or with no meaning. Such a tattoo doesn't make you look special or spiritual, it makes you look dumb. 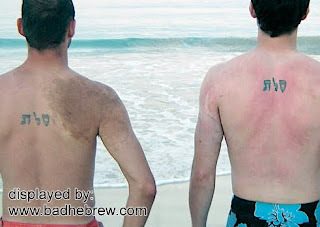 Considering a Hebrew tattoo? Browse this site first. on your iPhone. It's free! Have a Hebrew Tattoo story to tell? Got a special picture to share with the world? Sounds Like Easter To Me!